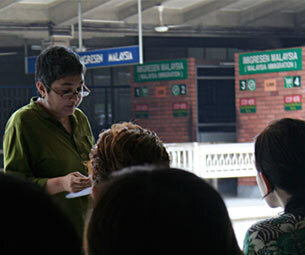 In her project, Simryn Gill (on the right photo) invites the audience to visit the Tanjong Pagar Railway Station, in order to view the murals in the large hall and think about their implications and history. To facilitate this, she has published a guide, which is only available on-site. This railway system connects Singapore with the Malay Peninsula, and the station as well as the rail track belong to Malaysia. That means, that a passenger getting on a train there is in fact already on Malaysian territory, although he/she still is in Singapore. 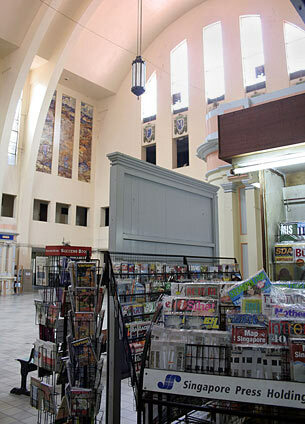 The railway system and with it the station are in many ways an anachronism, as are the murals, which provide a colonial image of Malaya.